Amazon have now matched the Overclockers UK price. Good price for a 1440p monitor with FreeSync (if you can live with the red colour! ), all that's missing is an IPS panel. As a fast gaming monitor, this is a good deal. Some people just don't know how to use the internet. lol ive not seen one of these flat pack monitors where the stand isnt detachable.... predominantly... because they are flat pack. Guilty as charged. But I did have a go and looked at the manufacturer's website, companies advertising it for sale, reviews. I didn't find the answer - so I asked for help. lol ive not seen one of these flat pack monitors where the stand isnt … lol ive not seen one of these flat pack monitors where the stand isnt detachable.... predominantly... because they are flat pack. I've seen one where only the "foot" comes off, leaving the "leg" attached. Knowing my luck, this one could have been like that.. I have been looking for a 1440 display for a while. I bought one of those cheap [sic] chinese ones... filed a claim 15 mins after receiving it and plugging it in.. PCB went and they wanted me to do a home repair on it with them sending the parts - avoid at all costs. This however looks very tasty, just want the price to come down a touch. No they don't do they. I have been looking for a 1440 display for a while. I bought one of those … I have been looking for a 1440 display for a while. I bought one of those cheap [sic] chinese ones... filed a claim 15 mins after receiving it and plugging it in.. PCB went and they wanted me to do a home repair on it with them sending the parts - avoid at all costs.This however looks very tasty, just want the price to come down a touch. Dya mean Korean? The PCB on them is extremely easy to replace. Luckily I haven't had to on mine yet, had it for a year and a half now But yeah, as you say, avoid if you're not too techy as the PCB can be daunting. Otherwise, most beautiful panel I've seen! Dya mean Korean? The PCB on them is extremely easy to replace. Luckily … Dya mean Korean? The PCB on them is extremely easy to replace. Luckily I haven't had to on mine yet, had it for a year and a half now But yeah, as you say, avoid if you're not too techy as the PCB can be daunting. Otherwise, most beautiful panel I've seen! 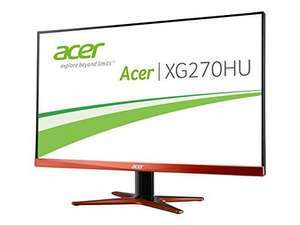 i got one of these on amazon's deal of the day a while back, great monitor especially if you have an amd gfx card that supports Freesync. Would this be fine with a PS4? I have a gaming pc but also a PS4 on the same desk that I use. Would this be fine with a PS4? I have a gaming pc but also a PS4 on the … Would this be fine with a PS4? I have a gaming pc but also a PS4 on the same desk that I use. Yeah im currently using a 1080p BenQ monitor for the PS4... I just didn't want to buy this and be disappointed.